Home - Allied Closing Title Services, Inc.
ALLIED Closing Title Services, Inc.
Allied Closing Title Services, Inc. is a full service title insurance agency dedicated to providing exceptional title insurance and real estate closing services to Realtors®, builders, lenders, and to the public. The company was created to provide faster and more accurate title services to Realtors®, but has evolved into a full service title company to meet the ever growing needs and demands of the industry. Throughout the state of Tennessee, we are prepared to handle your transactions. One of our major strengths lies within its people. We are proud of the top industry professionals who have joined our team and this pride is conveyed through our corporate “Sanctity of Contract” (described below) commitment. This commitment is more than just a concept to us, its a way of doing business. Our staff is dedicated to providing you with the type of service you expect…and depend on. The term ‘Sanctity of Contract’ derives from early English law. In those times, the English parliament allowed the common law courts to act in cases of ejecting a delinquent tenant, for example, but there was no action defined for breach of contract. The church courts ruled in these cases, and the term ‘Sanctity of Contract’ means a binding agreement whereby two parties can take sanctity in the insurance against any false claims. 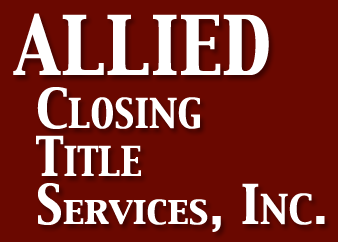 Allied Closing Title Services, Inc. is deeply committed to this premise that knowledge of the continuity of the title to land is the foundation for the lasting value of Real Estate. In the United States, as in no other country in the world, the dream of home ownership is a reality. We continue to invest in capital spending programs aimed at providing our customers with a competitive edge in the real estate and lending industries. Automated title research and closings appeal to brokers and lenders alike by smoothing and simplifying the closing process. The result is that, today and in the future, customers of Allied Closing Title Services, Inc. will have faster access and better information and will be beneficiaries of the most efficient title service anywhere. More important, you can be confident that you are planning and making decisions based on the best real estate information available.